I will try again, on the flip side of this one, and see what happens. I’ve learned with watercolor that it’s best to go in with no expectations, and hope for a pleasant surprise. It’s best, but I don’t always make it to the Land of No Expectations. Edited to Add: Thanks to Kirkistan for the title suggestion! Love it. Happy Friday Eve to all. Paint splatters and big smiles all ’round! I see lots of things here…great colors as usual. Thanks. I was pretty determined to make something out of it. Maybe I can work it into a quilt. We’ll see what happens on the back first, though. Yes a quilt would be great. so true – that is what I am learning and exploring with watercoloring. Last night I did like 5 paintings of an iris in 10 minutes – they are all loose and unique and different. It is so fun and freeing. Not sure if they are art, but they are fun. Watercolor is your medium, I think. I struggle with the loose and free part. I am too tied to the end result. Although I was happy with this one in the end, I guess. But very ticked off in the interim. Was not a good night. I bet yours are all beautiful! You seem to have a way with flowers and with the medium, so I’m sure the combined result is very cool! You’re totally right. My struggle with WC is that I did those two paintings and liked them. So I did a third, just changing the sky a bit….and it bombs? Why? The first two were fine. It was a different day with the third, and I was in a pretty bad mood when I sat down. Did that play a role? Probably. It’s pretty frustrating when you do X and Y and then Z is stubborn. It’s not like I just started doing watercolor either, so my expectations are even higher. I think your philosophy about your painting is helping your paintings. I sit down with a bad mood and I want the art I do to make things better. Always. This is why I started doing art. So when it makes it worse……yeah, ticks me off. lol. Any other medium, it works out. Day gets better! Not WC. It feels like a bad marriage I can’t get out of sometimes! But I get it – are we perfectionists a bit??!! Oh, a bit! Lol. No doubt. The thing is a good pencil, charcoal, CP sketch is never never never as good as something in WC that I’m happy with. And I dig in my heels. I don’t let anything stop me lol. Probably the wrong attitude for WC though. But I’m not a loose and free person. Not right now, anyway. I think your approach is much better! Does WC ever frustrate you? Make you wanna throw things? You know, Laura, it did initially – A LOT – until I’ve recently decided to loosen up – seriously – it sounds hokey – but it is seriously like magic. Now I wouldn’t even attempt to do something detailed, landscape, etc. – not nearly ready for that – don’t know if it is – or ever will be – my “thing.” I SURE admire it – but it overwhelms me. I like to do small single items right now. We’ll see where that gets me. 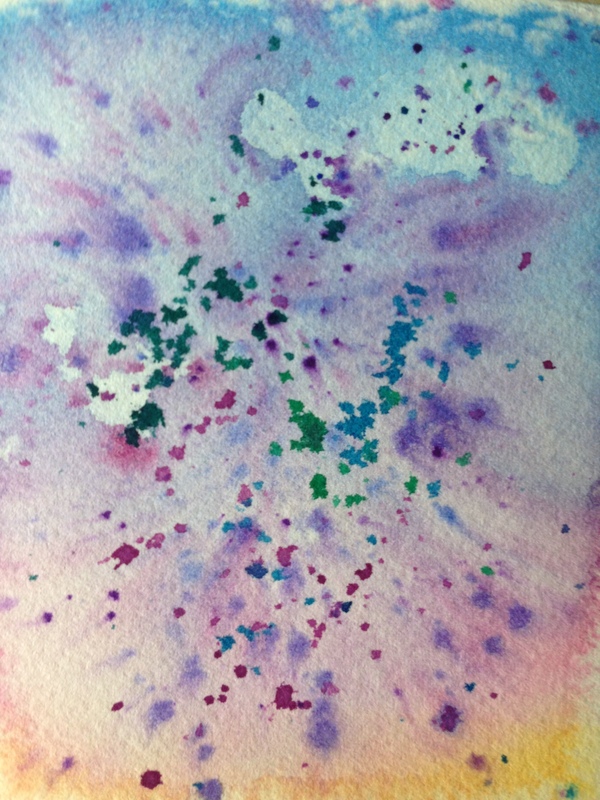 Watch for tomorrow’s post and let me know what you think of my 15 minute watercolors LOL! I’m sure they’re beautiful. Looking forward to it! I understand what you’re saying but not sure I can flip the switch. Hmm. “Decide” to loosen up. lol! I wish! I admire you for getting there though. I do think it helps the end result! Maybe in any medium, but definitely in WC. I think it really does matter in watercolor. Post prepared for tomorrow morning 🙂 – YIKES! I like a couple, but not all – will be anxious to hear your HONEST opinion! Please! Now I am second doubting – LOL!!!! LOL no worries. Your standards are much higher than other people’s, Jodi, I think. I always like your stuff, even when you cringe to post it. Whatev. Talk to the paw gf. Or the wing, in my case, lol! PS I’m working on that third WC painting while we’re chatting (and listening to a tax CPE webinar lol). A great outcome. Love the combination of colors. This is still quite beautiful. I really love the colours. Who knew that angry splaterrings could actually improve a painting. Making lemonade, Jo. Want some? Thanks. Ooh, with a vinyl coaster. Here y’are, ma’am! Lol. Lemonade. Now THAT’s cute. Wow i like that. It reminds me of fireworks at dusk. And the colors close and clouds behind. I really like that. Did I just read all that into it? To me that is stunning. Here’s to creating art every day! Thanks, Kirk! There’s definitely clouds; they were supposed to be in the original painting. Fireworks at dusk would make a great title for this! Kirk, I grabbed your title for this – I hope you don’t mind. If I make this into a quilt, it might keep the title! Oddly, that title makes me like this painting a lot more. Thanks. That’s cool. I like that image quite a lot. You could even cut it up and make little doodle books like I showed how to make on my blog today! 😄 Hope you will keep at watercolor! It has taken me years and many classes to get a FEEL for it. And I have to be in a calm state of mind or it frustrates me in a hurry. Sorry for writing a book here! LOL! Thank you for your book; don’t apologize!! Your sentence toward the end about approaching it in a calm state of mind really resonates. I think that’s where this painting went wrong – it happened before I got any paint on the brush! I’m glad you like it. More and more, I’m thinking about making this the centerpiece in a small quilt. Your confetti squares turned out great! I really like Kirk’s title. It suits this piece well. Thanks for your advice, Jill; you’ve got tons of art wisdom to share, and I always learn something when you speak! I will definitely keep at it, but I need to let go of the result. And approach it in a good mood, too, it sounds like. It makes total sense, and I’ve seen it happen more than once. I just need to start to really get that into my gut somewhere. Really get it. That usually helps me too, Jill, but every now and then I’m looking for a certain result, like for a project, you know? And then….that’s where I can run into frustration and disappointment. I think your attitude and Jodi’s is wonderful, and I’ll strive to get there! It’s a climb for me. The third painting (again, by luck) seemed to work out tonight, and will post tomorrow. At least, I like it. Not sure if anyone else will. But for today, I’m happy with wc again. I always love it, it’s just sometimes an abusive boyfriend I guess lol! Kirk gave me a terrific title and a way of feeling better about this painting. Thank you so much! I’m so glad you enjoyed it.